Large summits are nothing new. The 36th G8 summit will set up shop in Huntsville June 25-26. Toronto, a past host, will this time welcome the 4th G20 summit June 26-27. The following is the first in a six-part series of briefs looking back on past G7/G8 summits and protest. Check back each Sunday for a blast from the past when we recap a different summit's official agenda and civilian and activist responses. The 14th World Economic Summit in Toronto was held in a very different era. In 1988, the Berlin Wall and the Iron Curtain still divided the world into east and west; South Africa was still under the formal rule of apartheid; and Osama Bin Laden was seen by the US as a freedom fighter. However, similarities to the upcoming summit in Toronto might make this coming June feel like a recurring bad dream. Like the 2010 G8/G20 summits, 1988's G7 meeting was hosted in downtown Toronto at the Metro Convention Centre. It was also a year Canada played host to the Olympic Winter Games, held in Calgary. In the lead-up the 1988 summit, as much media attention was paid to Ronald Reagan's farewell to the G7 as to international fiscal policy—the summit’s official focus. Summit delegates also discussed supposed concern over continued repression in apartheid South Africa, and committed to reduce the debt of the world's poorest countries by one-third. Despite these pressing problems, some pundits believed no action was necessary on the part of the G7. "I don't see they have anything to do other than congratulate each other on how well things are going," wrote one economic analyst in the New York Times . Protesters who disagreed faced a four-meter-high steel and concrete fence surrounding the Metro Toronto Convention Centre, military helicopters hovering overhead and sharpshooters on Toronto’s rooftops. Total security costs for the summit were $29.3 million. 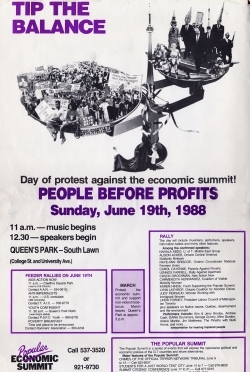 Three main groups organized against the G7 in Toronto: The Other Economic Summit (TOES), the Popular Summit Coalition which organized a counter-summit at Ryerson University, and the Alliance for Non-Violent Action (ANVA). Approximately 500 representatives from Third World economic organizations met at TOES. It was the first of what would become annual TOES in parallel with every G7/G8 summit thereafter, until their isolated locations made it logistically impossible. In advance of the summit, ANVA attempted to organize citizens' arrests of several G7 leaders, including Margaret Thatcher and Ronald Reagan, for international crimes of torture, bombing of civilians and support for apartheid in South Africa. Canada had recently passed a law which allowed for the possibility of denying perpetrators of such crimes entry into Canada. When ANVA’s lawyer attempted to get an injunction to this effect, they learned the G7 leaders had been granted immunity under Canadian law for the duration of their visits to Canada. Over the course of the summit, thousands of people protested. The largest rally from Queen's Park drew over 3,000 people, despite the threat of arrest by police. In total, 200 people were arrested. Protesters reported police violence during the summit and police surveillance in the days leading up to it.